Trying to pinpoint which of the newest crop of sires will be most successful is a difficult proposition for even the most skilled horsemen. At this point in a stallion's career, there are few statistics that can reliably isolate the leading contenders. The size of the first foal crop, first-crop CI, and first-crop CPI are three of the main figures that breeders and buyers use to gauge the potential of a stallion's first crop. 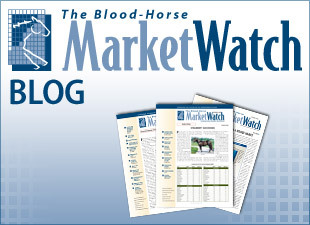 To determine trends that might identify 2014 freshman sire standouts, MarketWatch found the minimum and average figures achieved in first-crop foals, CI, and CPI for the leading freshman sires from 2003-13. Of 2014's 74 freshman sires, 19 met or exceeded the minimum figures. Only Eskendereya, Lookin At Lucky, and Quality Road exceeded the averages in all three categories. The table below lists each sire that met or exceeded all minimum figures. A green check indicates that the sire met or exceeded the average figure, while the red 'x' indicates that the sire fell short of the average. Presumably, the sires that are above average in these categories will have an advantage as their first 2-year-olds begin racing this year, but overlooked freshman sires (Posse, Congrats, Offlee Wild, etc.) often top the year-end list. Since 2001, none of the stallions that led their crops by either CI or CPI became leading freshman sire; Blame (leader by CI) and Quality Road (leader by CPI) will look to break that trend this season.